1 A None No Power Seat 1 A is a standard Business Class seat that may have extra legroom due to the position of the bulkhead, however, the proximity to the galley and lavatory may be bothersome. There is no floor storage for this seat during takeoff and landing. 1 C None No Power Seat 1 C is a standard Business Class seat that may have extra legroom due to the position of the bulkhead, however, the proximity to the galley and lavatory may be bothersome. There is no floor storage for this seat during takeoff and landing. 1 D None No Power Seat 1 D is a standard Business Class seat that may have extra legroom due to the position of the bulkhead, however, the proximity to the galley and lavatory may be bothersome. There is no floor storage for this seat during takeoff and landing. 1 F None No Power Seat 1 F is a standard Business Class seat that may have extra legroom due to the position of the bulkhead, however, the proximity to the galley and lavatory may be bothersome. There is no floor storage for this seat during takeoff and landing. 11 A None No Power Seat 11 A is a standard Economy Class seat with additional legroom due to the Exit Row, however, this seat has limited recline due to the other Exit Row behind. There is no floor storage for this seat during takeoff and landing. The tray table is in the armrest making the armrest immovable and slightly reducing seat width. 11 B None No Power Seat 11 B is a standard Economy Class seat with additional legroom due to the Exit Row, however, this seat has limited recline due to the other Exit Row behind. There is no floor storage for this seat during takeoff and landing. The tray table is in the armrest making the armrest immovable and slightly reducing seat width. 11 C None No Power Seat 11 C is a standard Economy Class seat with additional legroom due to the Exit Row, however, this seat has limited recline due to the other Exit Row behind. There is no floor storage for this seat during takeoff and landing. The tray table is in the armrest making the armrest immovable and slightly reducing seat width. 11 D None No Power Seat 11 D is a standard Economy Class seat with additional legroom due to the Exit Row, however, this seat has limited recline due to the other Exit Row behind. There is no floor storage for this seat during takeoff and landing. The tray table is in the armrest making the armrest immovable and slightly reducing seat width. 11 E None No Power Seat 11 E is a standard Economy Class seat with additional legroom due to the Exit Row, however, this seat has limited recline due to the other Exit Row behind. There is no floor storage for this seat during takeoff and landing. The tray table is in the armrest making the armrest immovable and slightly reducing seat width. 11 F None No Power Seat 11 F is a standard Economy Class seat with additional legroom due to the Exit Row, however, this seat has limited recline due to the other Exit Row behind. There is no floor storage for this seat during takeoff and landing. The tray table is in the armrest making the armrest immovable and slightly reducing seat width. 12 A None No Power Seat 12 A is a standard Economy Class seat that has additional legroom due to the Exit Row. There is no floor storage for this seat during takeoff and landing. The tray table is in the armrest making the armrest immovable and slightly reducing seat width. 12 B None No Power Seat 12 B is a standard Economy Class seat that has additional legroom due to the Exit Row. There is no floor storage for this seat during takeoff and landing. The tray table is in the armrest making the armrest immovable and slightly reducing seat width. 12 C None No Power Seat 12 C is a standard Economy Class seat that has additional legroom due to the Exit Row. There is no floor storage for this seat during takeoff and landing. The tray table is in the armrest making the armrest immovable and slightly reducing seat width. 12 D None No Power Seat 12 D is a standard Economy Class seat that has additional legroom due to the Exit Row. There is no floor storage for this seat during takeoff and landing. The tray table is in the armrest making the armrest immovable and slightly reducing seat width. 12 E None No Power Seat 12 E is a standard Economy Class seat that has additional legroom due to the Exit Row. There is no floor storage for this seat during takeoff and landing. The tray table is in the armrest making the armrest immovable and slightly reducing seat width. 12 F None No Power Seat 12 F is a standard Economy Class seat that has additional legroom due to the Exit Row. There is no floor storage for this seat during takeoff and landing. The tray table is in the armrest making the armrest immovable and slightly reducing seat width. 29 C None No Power Seat 29 C is a standard Economy Class seat whose proximity to the galley and lavatory area may be bothersome. 29 D None No Power Seat 29 D is a standard Economy Class seat whose proximity to the galley and lavatory area may be bothersome. 29 F None No Power Seat 29 F is a standard Economy Class seat that is missing a window. 30 A None No Power Seat 30 A is a standard Economy Class seat in the last row of the aircraft that is missing a window. This seat has limited recline. The proximity to the galley and lavatory area may be bothersome. 30 B None No Power Seat 30 B is a standard Economy Class seat in the last row of the aircraft. This seat has limited recline. The proximity to the galley and lavatory area may be bothersome. 30 C None No Power Seat 30 C is a standard Economy Class seat in the last row of the aircraft. This seat has limited recline. The proximity to the galley and lavatory area may be bothersome. 30 D None No Power Seat 30 D is a standard Economy Class seat in the last row of the aircraft. This seat has limited recline. The proximity to the galley and lavatory area may be bothersome. 30 E None No Power Seat 30 E is a standard Economy Class seat in the last row of the aircraft. This seat has limited recline. The proximity to the galley and lavatory area may be bothersome. 30 F None No Power Seat 30 F is a standard Economy Class seat in the last row of the aircraft that is missing a window. This seat has limited recline. The proximity to the galley and lavatory area may be bothersome. 4 A None No Power Seat 4 A is a standard Economy Class seat. The curtain divider between Business and Economy may be bothersome. There is no floor storage for this seat during takeoff and landing. 4 B None No Power Seat 4 B is a standard Economy Class seat. The curtain divider between Business and Economy may be bothersome. There is no floor storage for this seat during takeoff and landing. 4 C None No Power Seat 4 C is a standard Economy Class seat. The curtain divider between Business and Economy may be bothersome. There is no floor storage for this seat during takeoff and landing. 4 D None No Power Seat 4 D is a standard Economy Class seat. The curtain divider between Business and Economy may be bothersome. There is no floor storage for this seat during takeoff and landing. 4 E None No Power Seat 4 E is a standard Economy Class seat. The curtain divider between Business and Economy may be bothersome. There is no floor storage for this seat during takeoff and landing. 4 F None No Power Seat 4 F is a standard Economy Class seat. The curtain divider between Business and Economy may be bothersome. There is no floor storage for this seat during takeoff and landing. On long-distance flights, this aircraft offers a variety of audio channels such as Classical music and Pop music. Audio options are listed in Brussels Airlines' magazine, b.spirit. 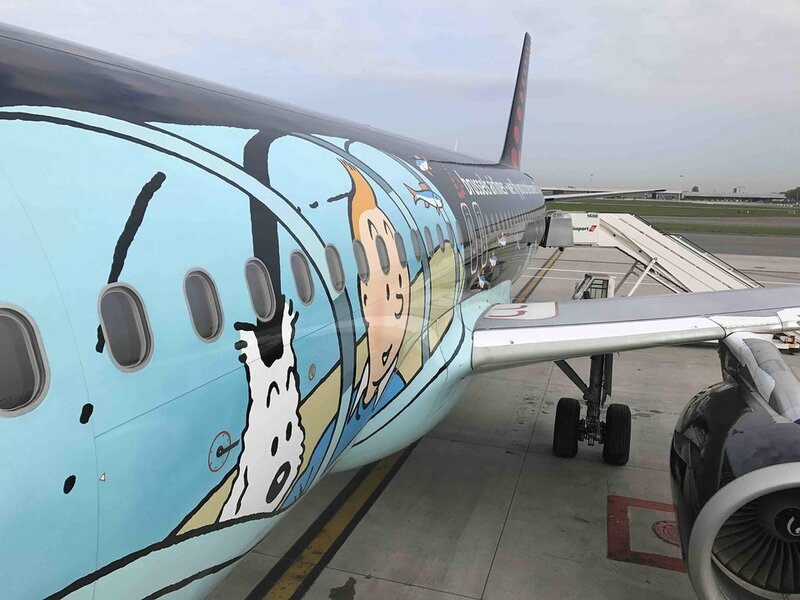 Brussels Airlines provides premium food and beverages for its b.business passengers and the airline offers a warm meal or snack, depending on the time of day, to its b.flex economy+ passengers. b.light economy passengers may purchase a variety of drinks and snacks. 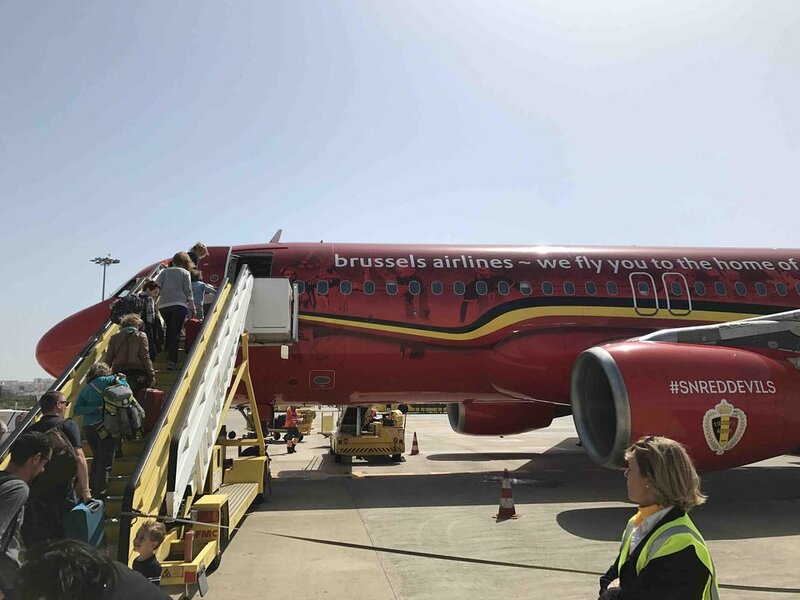 This A320 aircraft seats 180 passengers however, only 174 seats are bookable since the middle seats in Business are blocked off by Brussels Airlines to provide additional space. There are 12 Business Class seats and 162 Economy Class seats. Brussels Airlines flies 2 versions of Airbus A320.